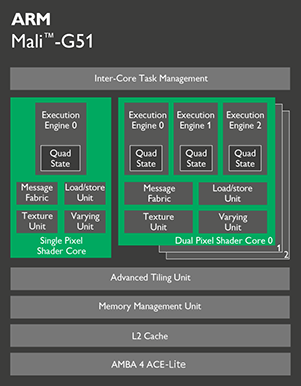 The Arm Mali-G51 is the latest offering in the High Area Efficiency line of Arm s Mali family of GPUs, the number one shipping GPUs in the world. The second GPU to be built on our new Bifrost architecture, Mali-G51 brings premium use cases and optimized graphics performance to mainstream devices. Sophisticated graphics and UI content analysis has ensured a balanced design supporting the requirements of the complex content of the future.